I’ve been knitting again. I am still very much a beginner, but I don’t need any cafetiere or hot water bottle covers, so I am knitting ‘easy’ jumpers. The pattern and wool are from Birmingham’s new John Lewis store. Hence, this is quite an expensive make. 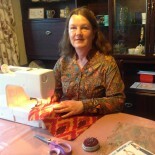 In general I am pleased with it and have enjoyed knitting it – but the sleeves are a bit long, which will limit its day to day wear. As with my previous knit, I forgot to change the needle size after the ribbed band on the back, so deliberaltely did the same thing on the front. I got it right on both sleeves! I don’t think it matters. 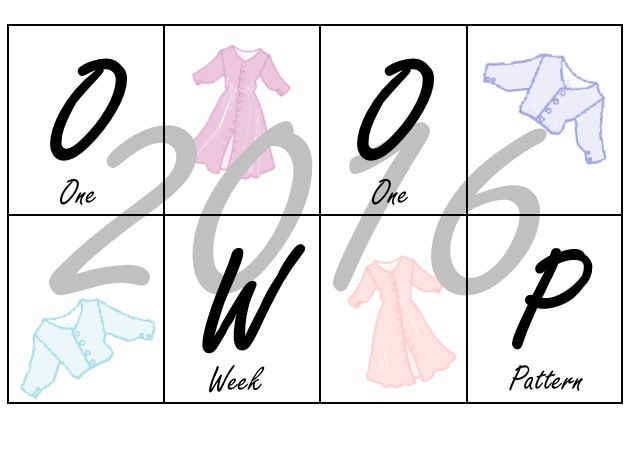 I made copious notes about my progress with the 4 row pattern, always aiming to finish any work on the 4th row. I can see a row that it wrong, and you will be able to as well, if you look closely. I don’t know how that happened, as I thought I was fastidious with the notes. I think it happened when I finished for a day, when I have found that I have a habit of not updating my notes as I gather together my knitting bits and store them for the night. I don’t think that matters either! I managed to keep my head together as I shaped the right side round the neck, but had real trouble getting my head round doing it all the other way round on the left side. I must have unravelled the left side about 3 times back to the re-joined wool. I found it helped when I drew out what I needed to do. But I think I have managed to finish the jumper with very little evidence of the problems that I had in this area. 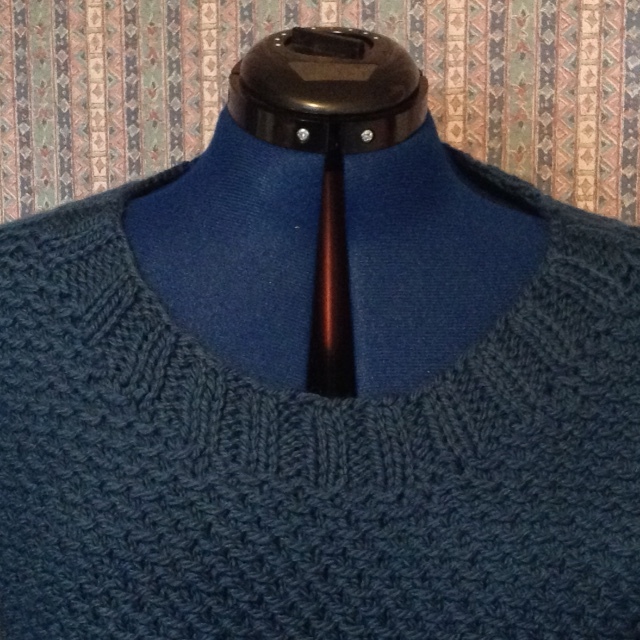 I read the pattern wrong before doing the neck band, but i’m actually pleased that I did…. I sewed up both the left and right shoulder seams, probably influenced by the fact that I was doing the same thing on a dress that I had been sewing earlier in the day. How to knit the neck band? 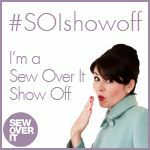 especially as I have read blogs and books that talk about picking up stitched being a scary process – maybe like setting in sleeves for a sewist, which, i’m pleased to say, I don’t find scary. That fact encourages me. The neck band knitting was made all the more puzzling as I had sewn both shoulders together and therefore had a round object that would clearly be a problem to knit on straight needles. So off I went to my chief source of advice for knitting matters – the staff at Guthrie-Ghani (Thanks Rachael)- and came out with suitably sized needles for knitting in the round. And here is the result, of which I am really proud! Again I drew a picture of the stitches to be picked up, and marked off the edges into groups of 5 – 6 stitches. Then, keeping the first stitch marked, I just knitted in the round until it was long enough. Great – no seams and it didn’t take very long. I will happily make the same mistake again! The sleeves were simple to knit and I don’t think that I made any mistakes, other than to knit them too long. Anyway, lesson learnt. I will check the sleeve length on future makes. I’m presuming that there is very little that I can do about it now. I recommend this pattern for enthusiastic beginners. I grows quickly. You can tell fairly easily if you have made a mistake with the pattern, and there aren’t any scary stitches. It’s all just knit and purl and lots of slipping, but hey! that’s easy. 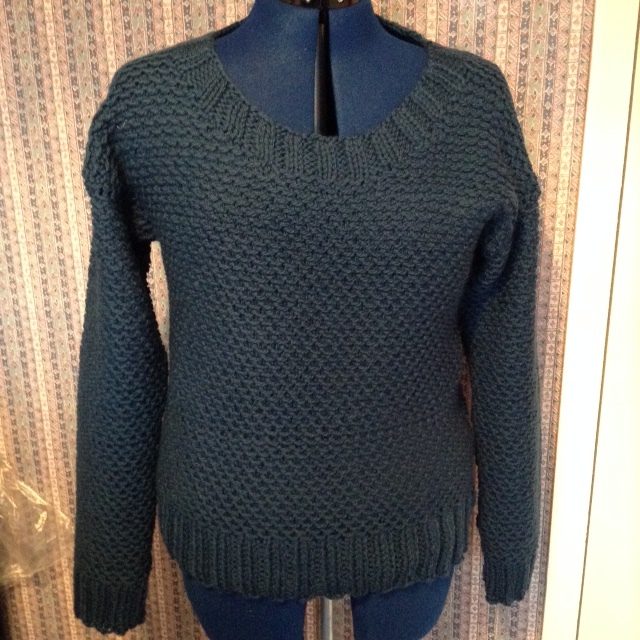 This entry was posted on January 4, 2016 by ann hebden in Erika Knight, Fashion, Jumpers, Knitting, Novice knitting, Sweater and tagged Erika Knight, Handmade, Jumper, knitting, Loop stitch sweater, novice knitting.